CRITERION FINDS US VERSION OF GODZILLA! "More Fantastic Than Any Written By Jules Verne?" Yesterday, I posted the fantastic news that the Criterion Collection had slyly announced, with a simple photo, that they will be prepping a DVD/BD release of the original Japanese version of GODZILLA aka GOJIRA (1954) — see previous blog post — and while, it seems, that Honda's seminal film will be getting a much-needed restoration, some have been asking if the corresponding US version helmed by Terry O. Morse, GODZILLA, KING OF THE MONSTERS! (1956), starring Raymond Burr, will be included in this release. Previous home video releases of this film — and all versions screened on television, cable, and online in the last 30 years — have been culled from the same, edited telecine transfer of a 35mm master, prepared in the early 1980s by Henry G. Saperstein's UPA (United Productions of America). Unfortunately, Toho has nothing for the US version (barring the cropped "cinemascope" version released in Japan in the late 1950s), and since there was nothing else readily available, Classic Media used this very same three decade-old transfer for their 2006 release. What was deleted? UPA's transfer is missing the original "A Transworld Release" logo at the top of the film (printed over Toho's sunburst logo), seen in early television versions (before UPA's acquisition), a starring and directed by card after the opening title, and the original — and full — ending credits sequence, which appeared between the fade out and "The End" title card. While Classic Media's release, reinstates the original ending credits sequence (taken from a 16mm print owned by a private collector), it was placed after the "The End" title card. But, the other two deletions remained absent. 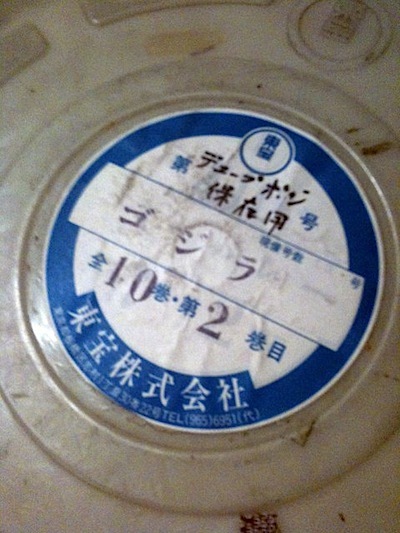 While several fans have 16mm prints of the initial television transfer of GODZILLA, KING OF THE MONSTERS! (from a Reduction Negative) — some complete, others not — the search for original 35mm negative elements, or at the very least, an uncut 35mm theatrical print, had proved to be elusive. While there are several private (and notable) collectors who do have 35mm prints of this film, most of them wish to remain nameless, out of fear that these prints will be confiscated (which has indeed happened to collectors in the past). In plain English, this means that the next best thing to finding an original Interpositive (the first "positive print" made from the Camera Negative) — a first-generation print! So, while celebrating this early may be premature, I'm going to start popping the Champagne (or maybe some Champipple) — because a transfer from this Fine-Grain should prove to be stunning in comparison to what has been previously available to us, especially once such a transfer gets a Criterion Touch digital restoration! Many of you out there may not quite grasp the monumental thing that has happened here. This is an earth-shaking, screen-shattering thrill! This is big news, towering and tremendous — akin to the discovery of a Missing Link — and is more fantastic than I ever thought possible, to paraphrase Burr's character in GODZILLA, KING OF THE MONSTERS! In the meantime, while the pieces fall into place, let's just keep our fingers crossed for Criterion, but not hold our collective breath (we don't want to jinx this, do we?). But still, so far, this really has been a "tale to stun the mind!" DVD & BD Release Coming Soon? "You may wish to deny it; but your eyes tell you it's true!" Thanks to several insiders associated with the Criterion Collection, I was notified several months ago that Janus Films had acquired the rights to the original GODZILLA (1954), for a possible — and proper — DVD & BD release in the near future. More tell-tale signs that this was indeed a strong possibility, appeared on Criterion's Hulu page earlier this summer, which began offering free viewings of the Americanized version of the original, GODZILLA, KING OF THE MONSTERS! (1956), starring Raymond Burr. This was shortly, and unceremoniously, joined by the original, uncut Japanese version with English Subtitles (both were available for free viewing without a subscription to Hulu Plus). Perhaps this was a teaser of something in the works? Could it be a dream coming true after 20 years: A deluxe, Criterion Collection Edition of GODZILLA, Spine #600? "He must've had too much Sake." Fans began speculation, in which some self-procalimed "authorities" doubted this possibility (citing Classic Media's licenses to both versions) or speculated/proclaimed that Criterion would only be able to gain access to Toho's recent HD Broadcast masters (used for their domestic BD releases, which still falls short of a very much needed complete restoration), fundamentally underestimating the core of what makes Criterion/Janus Films tick. Then, without warning, both films were pulled from Criterion's Hulu page as rumors (from insider sources) mounted that Criterion was indeed plotting to unleash both films on Home Video. Then, this afternoon, Criterion posted a cryptic photo of a film can — emblazoned in Japanese writing — on their Official Facebook page, which received over a hundred "likes", and numerous comments, all within two hours. Few could read the label on the film can — which translates: "Dupe Posi(tive): GODZILLA. Reel 2 of 10 Reels. Toho Company, Ltd."! 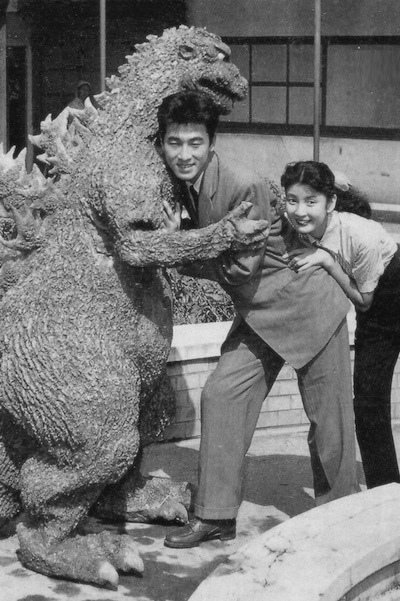 "You have your fear, which might become reality; and you have Godzilla, which is reality." This immediately washes away any concerns over such a forthcoming release being a shovelware port of the Japanese BD or an upgrade from the aforementioned HD Broadcast Master from Toho — it would appear that Criterion is going to master this from the Interpositive elements! Such a move bodes well for a long overdue and desperately needed restoration for a film that suffers from a number of physical blemishes and damage, beyond the insulting "spackling" done with DVNR (digital video noise reduction) filtering — hardly addressing the real issues the original negative suffers from. If Criterion can conjure the same painstaking and meticulous alchemy bestowed upon their release of Kurosawa's timeless masterpiece, SEVEN SAMURAI (1954), which also suffered from many of the same ills as GODZILLA, then both cinephiles and genre fans, alike, will have a much justified reason to celebrate: A proper presentation to honor the legacies of Ishiro Honda and Eiji Tsuburaya — at long last. Disclaimer: For those unable to parse between my above speculation (based on available facts) and an official statement or press release (which has yet to be issued) — sorry, I'm not responsible for your inability to grasp such basic concepts.